While alcoholism is an illness that can certainly be treated and managed effectively on an ongoing basis, there is currently no cure. With the right treatment programme and a real desire to achieve long-term sobriety, alcoholism can become a thing of the past. It will require a comprehensive treatment programme that incorporates a detox, coupled with behavioural therapy and medication (if appropriate). It should also be followed up with aftercare support and ongoing relapse prevention techniques. Can Alcohol Addiction be Cured? There has long been a debate over whether alcoholism is merely a behaviour that can be modified or an actual disease requiring medical treatment. The American Medical Association (AMA) was one of the first organisations to classify alcoholism as a disease in 1956. Decades later, the World Health Organisation’s International Classification of Diseases listed alcoholism as both a psychiatric and medical condition. The general consensus among professionals now is that alcoholism is a brain disease characterised by both physical and psychological dependence on alcohol. It is a condition best treated by professionals with experience, knowledge, and the right tools to help alcoholics along their individual roads to recovery. Clinicians within the alcohol recovery field like to say that ‘the only cure for alcoholism is abstinence’. To the extent that such statements are true, it is probably more accurate for us to say that alcoholism can be effectively treated. With effective treatment and an unbroken commitment to never consume alcohol again, you or a loved one can recover from addiction. This, of course, is fully dependent on maintaining life-long absence. The quickest route back to alcoholism is to start drinking after committing to never drinking again. Being treated for alcoholism may mean being prescribed a drug known as naltrexone. First introduced in 1965, naltrexone has a long history of being prescribed to help manage both alcohol and opioid dependence. It can be administered through either injections or oral medications. Naltrexone works by blocking opioid receptors in the brain, thereby reducing the pleasurable effects of alcohol. It is used to help reduce alcohol consumption or prevent relapse after completing rehab. A typical course of naltrexone lasts for about six months or so. Baclofen is a medication originally derived to treat muscle spasms. It is primarily a central nervous system depressant and muscle relaxant that works very well for people suffering from spinal cord injuries, cerebral palsy, multiple sclerosis, and certain other diseases. In 2014, French authorities approved studying baclofen as a possible treatment for alcoholism. There is some evidence that the drug can help reduce alcohol withdrawal symptoms, thus facilitating better detox and better long-term recovery. Note that this drug is still in the experimental stage for alcohol treatment. Nalmefene is another medication that seems to benefit recovering alcoholics by blocking opioid receptors. It is a drug that reduces alcohol cravings by lessening the amount of pleasure the brain perceives from drinking. As such, this drug is less a cure for alcoholism and more a way to manage problem drinking. As you can see from the descriptions of the three medications listed here, there is no cure for alcoholism. There is only recovery. This is an important distinction in that remaining free from alcohol dependence requires permanent abstinence. Recovery is facilitated through medical treatment, including prescription medications and rehab, but it is ultimately maintained by staying away from alcohol. Treatment for alcoholism should begin as soon as a person is diagnosed as an alcoholic. However, you do not have to wait for a diagnosis if you are already struggling with alcohol. Treatment can, and should, begin as soon as you come to the realisation that you have a drinking problem. NHS guidelines speak extensively of alcohol misuse as opposed to alcoholism. They classify alcohol misuse as a spectrum of sorts, with varying levels of seriousness depending on how much and why a person drinks. 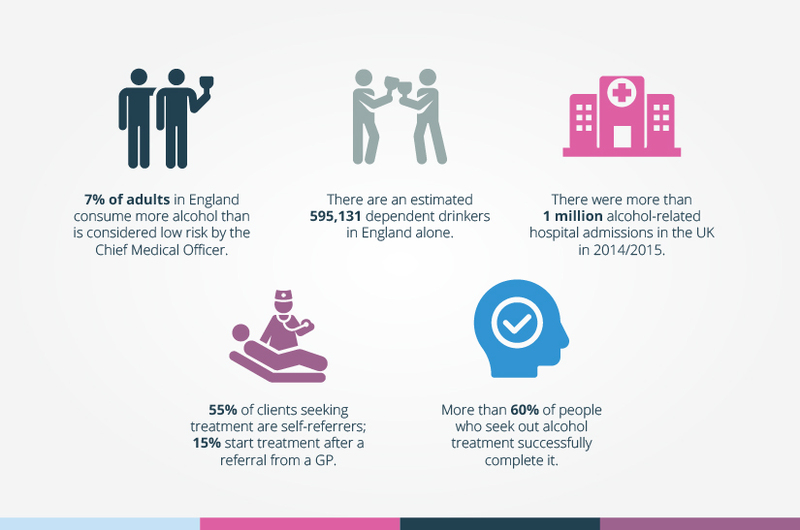 The NHS standard is to seek treatment if you are at all concerned about your own drinking habits. Treatment can be as minimal as brief intervention counselling or as extensive as residential rehab. Alcohol detox in the modern era almost always involves the use of prescription medications to control cravings and reduce withdrawal symptoms. We are of the firm belief that it should always be medically supervised. In terms of options, detox programmes are divided into two categories: outpatient and inpatient. Outpatient detox is provided through day clinics attended by recovering alcoholics for the purposes of managing symptoms and prescribing medications. 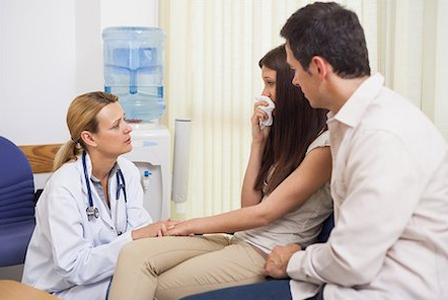 Inpatient detox takes place at an inpatient rehab facility. It is medically supervised as well. Inpatient detox is usually offered in conjunction with a residential rehab programme, but it doesn’t have to be. 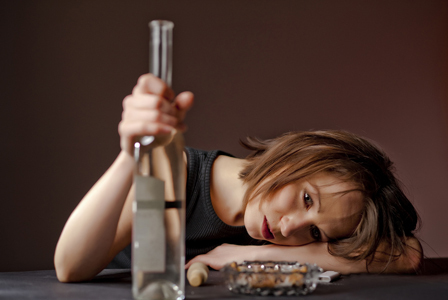 Rehab from alcoholism can also be obtained on either an outpatient or inpatient basis. 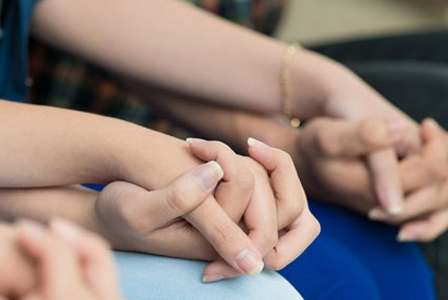 Outpatient rehab involves a combination of services that may include regular counselling, medical exams, and involvement in a local alcohol support group. You would be expected to take full responsibility for yourself in an outpatient treatment scenario. Inpatient rehab is generally a 4-to-12-week programme that takes place at a dedicated facility specialising in addiction. Rehab includes group counselling, one-on-one counselling, life skills building, and other services intended to help you understand your condition and overcome it. Aftercare services generally follow. The simple answer to this question is ‘no’. All the medications currently available as treatments for alcoholism can only be counted on to either reduce cravings or manage withdrawal symptoms. As stated earlier, there is no cure for alcoholism. There is only treatment. It is also important to note that using medications without modifying drinking behaviour can create a more serious problem. A doctor’s prescription will be accompanied by advice directing you to seek counselling and/or support group participation. What Approved Medications Are Available? This medication is generally prescribed to recovering alcoholics who have already achieved abstinence. It is a relapse prevention medication that works by reducing the level of a certain chemical in the brain believed to contribute to alcohol cravings. This medication is also used primarily as a relapse preventer. However, it can also be used to encourage abstinence in individuals struggling with alcohol. Disulfiram works by creating an unpleasant physical reaction to alcohol consumption. It prevents the liver from absorbing alcohol, thereby creating a hangover within minutes of taking a drink. As described earlier, this drug is often prescribed for treating alcohol misuse because it can reduce alcohol cravings by blocking opioid receptors. It may be prescribed to prevent relapse or to help someone reduce the amount he or she drinks. Another drug that acts as an opioid receptor blocker is nalmefene. Like naltrexone, it can be prescribed either to prevent relapse or to help a person reduce alcohol consumption. Counselling is an integral part of alcohol recovery. It goes hand-in-hand with both prescription medications and detox. It is necessary in order to help you understand why you drink, the kinds of things that trigger alcoholic behaviour, and how to avoid future relapse. There are a variety of forms of counselling that therapists employ during alcohol rehab. Key to all of them is helping clients understand their condition in both physical and psychological terms. With that understanding, clients can be equipped with the tools they need to stay away from alcohol in the future. Note that counselling often continues even after formal treatment has ended. If you were to complete an inpatient treatment plan, counselling would be provided through an aftercare programme. How long counselling continues depends on how well you respond to it. Also, note that counselling does not necessarily have to occur in a therapist’s office. Counselling also takes place via local alcohol support groups and their weekly meetings. You should avail yourself of as much counselling as you need to maintain abstinence. Utilise the services of addiction hotline counsellors capable of matching you with the best treatment centres. Get GP input as to what constitutes the best form of treatment for your circumstances. Assuming inpatient treatment is chosen, consider the level of accommodations you prefer. Examine the cost of inpatient treatment as compared to your available budget. Schedule a meeting with clinic admission staff to go over what that clinic offers. Schedule a visit to the chosen facility prior to admission. Selecting the right treatment is more about research than anything else. If you are looking for treatment for yourself or a loved one, do as much research as necessary to put your mind at ease. And whatever you do, don’t be afraid to ask questions. Asking questions is the only way to learn about all your options. Recovering from alcoholism is rarely easy. It is a long, time-consuming journey that requires continually putting one foot in front of another. If we could offer recovering alcoholics only one piece of advice, it would be this: never give up. Be persistent in reaching your goal of alcohol recovery. It is like running a marathon – you keep running until you reach the finish line. Like a marathon runner benefits from the support and encouragement of others, you can benefit from the support provided by your treatment providers, counsellors, friends, and family. Lean on that support whenever the road to recovery gets hard. And it will get hard. But with a combination of your persistence and the support of those around you, you can make it. The difficulty of overcoming alcoholism is such that relapse is a common occurrence. Do not let this discourage you. For a lot of recovering alcoholics, relapse is a normal part of the process that has to be overcome. Your goal is to eventually become alcohol abstinent, but you may not be able to achieve that immediately after completing treatment. That’s okay. Just pick yourself up and try again. Keep on trying until treatment eventually pays off in a complete and full recovery. Perhaps you are the family member or friend of an alcoholic. We understand that you are affected by your loved one’s condition. We encourage you to seek out counselling that will help you cope with the situation you find yourself in. You need help every bit as much as your alcoholic loved one. Please understand that you cannot force your loved one to stop drinking. And if you try to force him or her into rehab, you may do more harm than good. Let the affected person know you are there to offer your support during treatment. Let him or her know of your care and concern as well. Do not enable or encourage bad decisions, though. Should you choose to seek out treatment options on behalf of your loved one, we invite you to collect as much information as you possibly can. You might also talk to a professional about conducting an intervention. Interventions have proved successful tools for encouraging alcoholics to seek treatment. You have undoubtedly heard of alcohol support groups like Alcoholics Anonymous. Please know there are similar organisations known as mutual support groups. They work with recovering alcoholics and their families simultaneously. Through mutual support, all the parties affected by alcoholism can work towards recovery. Residential rehab facilities are also known to employ the mutual support model. They may offer mutual counselling sessions that bring alcoholics and their family members together. These kinds of sessions are generally separate from the individual sessions clients receive in rehab. Alcoholics Anonymous is the oldest support group for alcoholics in the world. It was founded in the 1930s by two Americans recovering from their own alcohol misuse. Here in the UK, there are thousands of local chapters staffed by dedicated volunteers ready and willing to do whatever it takes to help. Many of them are recovering alcoholics themselves. In an AA support group, you will meet with others who were travelling down the exact same road. You will learn from their experiences, be encouraged by their support, and have the opportunity to teach and support others. You may even decide to volunteer your own time and efforts long after you achieve permanent abstinence. Participating in an AA group is a terrific way to give back. When all is said and done, there is no medical cure for alcoholism. However, there is recovery facilitated by professional treatment that includes detox, counselling, prescription medications, and aftercare. If you or a loved one is suffering from alcoholism, there is no need to wait to seek treatment. UKAT is standing by to help you start addressing your problem right away. Why is there no cure for Alcoholism? Although alcoholism is an illness of the brain, unlike other illnesses, there is currently no cure for it. When an alcohol addiction is present, the brain is physically altered by the act of chronic alcohol abuse; certain pathways in the brain are altered or damaged. It is this damage that cannot be undone. While it is possible to 'rewire' the brain around recovery, the risk of a return to addictive behaviour will always be present. However, just because alcoholism cannot be cured does not mean that it cannot be effectively treated and managed. It is, therefore, possible to live an alcohol-free life without ever experiencing a return to alcohol use. What treatment is most effective? It is difficult to say which treatment is most effective when it comes to alcohol recovery as everyone is different and each person has different needs in terms of alcohol treatment. The same treatment is therefore not going to be effective for everyone. It is generally accepted that a comprehensive programme of recovery needs to incorporate detox, rehabilitation, and aftercare. Within that, various therapies and medications may be used, but each person will be provided with a plan of treatment that is expected to be most effective for his or her specific needs and circumstances.